COUNTRY CHARMER!! Nestled in a small whispering southern pine forest on a cul-de-sac this cedar sided frame home is sure to please with its open concept, wood burning fireplace, updated kitchen, vaulted ceilings, 2 car garage and lots of storage space. The spacious master suite has a wrap around closet dressing style space in the bathroom you&apos;ll love. It boasts an inviting front covered porch, large back deck and huge fenced in back yard. This pretty family home offers a lot of privacy and the trees keep the house cool on those hot summer days. 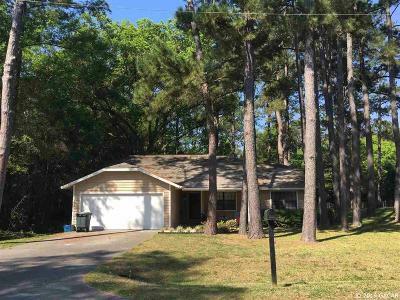 You&apos;ll love the well established neighborhood and the convenient location it has to work / shopping in Gainesville.